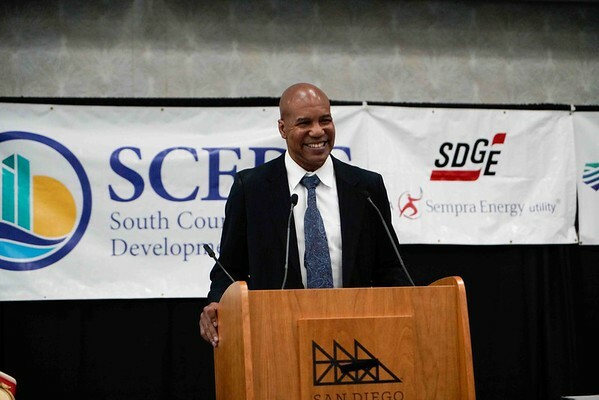 SAN DIEGO, September 18, 2018 – Panelists and speakers at the South County Economic Development Council’s 28th Annual Economic Summit came together last Friday to discuss the opportunities the South Bay holds to providing affordable housing and sustainable employment options for the future of San Diego County. The summit’s masters of ceremony included Doug Kerner, SCEDC chair, Hon. Dukie Valderrama, Commissioner of the Port of San Diego, and Tony McCune, founding member of SCEDC. The summit is the largest public forum the South County EDC holds annually. For more information on the summit and upcoming South County events and development, visit www.southcountyedc.com or email [email protected].